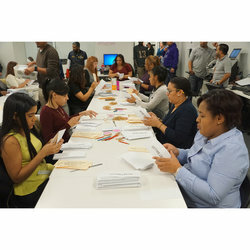 Rank and file transit workers have ratified a new 28-month contract with the MTA by a 70-30 percent margin. In total, transit workers voted 10,540 in favor vs. 4,571 against. Divisional breakdowns will be available tomorrow. Balloting was conducted by the American Arbitration Association. The count took place at AAA’s offices at 120 Broadway. The contract covers Local 100 members employed by MTA-NYCT, MTA-MABSTOA and MTA Bus. TWU Local 100 President John Samuelsen said of the ratification: “I want to thank rank-and-file transit workers for their strong show of support in ratifying this agreement with the MTA. They recognized that the contract provides wage increases and other economic enhancements that will keep transit workers ahead of inflation, and fully protects their health coverage and wins important medical benefit gains without the concessions that are enshrined in city and state public sector patterns. It secures an unprecedented "me too" wage guarantee with the LIRR unions, which have the right to strike and are governed by federal law and wage patterns set by the national freight and commuter railroad sectors. "The contract does not lock us into a long-term commitment, which provides an important hedge against any unforeseen spike in inflation. For the first time, this contract has secured an agreement from the MTA to hire and utilize in house forces to retrofit the older parts of the transit infrastructure to provide clean, comfortable and safe crew areas for our sisters in transit. "Over the next several months, our union will be plotting the course for 2017 and 2018, knowing that the potential of a national right-to-work bill and other destructive anti-trade union laws are likely coming our way. In this age of national political uncertainty, we must unite or risk great harm. In the coming months, I will be making extraordinary efforts to unify Local 100 to face this oncoming battle."